On finishing Joseph O’Neill’s Blood-Dark Track: A Family History Saturday, I struggled to decide what book to read next. Among my options were the books I’d just received for my non-birthday, plus Peter Brown’s Through the Eye of a Needle: Wealth, the Fall of Rome, and the Making of Christianity in the West, 350-550 AD (which I’d just read about the day before), Charlie LeDuff’s new book Detroit: An American Autopsy (which has been widely reviewed in the past month; and I’ve gone almost four months without reading a Detroit book), and Mischa Hiller’s thriller Shake Off (Malcolm Gladwell’s favorite book of 2012, for what that’s worth). “Red Plenty” is not a book to which one brings great expectations. It’s about Soviet Russia in the 1950s and ’60s, a gray topic, prechewed by many others. Mr. Spufford tries to shoo away readers, too, in his introduction. That’s where he explains that his book is not quite history and not quite fiction but something in between, a mongrel narrative in which an “idea is the hero.” Those four words can make you scan for the exit signs. The idea that underpins “Red Plenty” is an economic one. 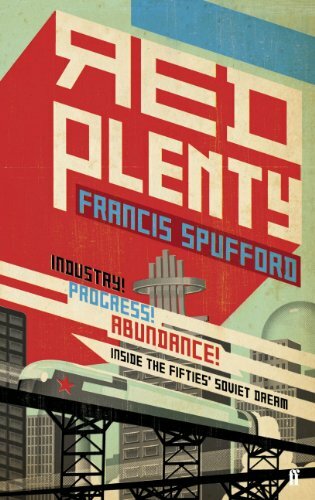 This book is about the old sunny Soviet fairy tale, the notion that a planned economy would become, in Mr. Spufford’s memorable phrase, “its own self-victualling tablecloth.” His book is about the era when Russians really thought their version of Communism would make them the richest and happiest and most unfettered people in the world. It explores the lives of more than a dozen characters, a few of them famous (we meet Khrushchev, before and after his forced retirement), most of them not. Many are actual people; some are pure invention. Mr. Spufford explains his methods in an extended, David Foster Wallace-like series of endnotes that nearly constitute a novel in themselves. There may be those among the readership of this paper who doubt, instinctively, whether a novel about the reform of the planned economy in the Soviet Union will while away their leisure hours in an entertaining fashion. Let me set their minds at rest immediately. Francis Spufford’s new book is a virtuoso piece of storytelling, a series of vividly imagined episodes – by turns funny, poignant, spine-chilling and warm – that conjure up a richly detailed world. Red Plenty is peopled by both real and fictional characters: brilliant young scientists and economists, low-level Party members and factory managers. Each one, even the most corrupt, is drawn with such a generous understanding that I found myself stalling at the end of every chapter, regretting already that I would soon be leaving their company. Its mood is far from the usual depressing USSR of novels and memoirs, with their landscape of cynical Party members and heroic dissidents. Those elements are here, yet they are woven into the broader context of the Thaw, the years of relative prosperity and optimism after Stalin’s death. “This is not a novel… it is a fairy tale,” Spufford claims in his prologue and there really is something magical, almost uncanny, in his ability to create such a marvellously satisfying, technicolour world. Particularly as, he tells us, he does not speak Russian and has only visited Russia briefly. Above all, however, this is a novel of ideas – or one, overwhelming idea, relevant to us in post-credit crunch times. Was it possible that the Soviet Union could have delivered prosperity and an advanced technological society to its citizens as well as the West? Well, you get the idea. And perhaps you see why I decided to download the free opening portion and begin. The first chapter transported me to 1938 Leningrad, joining young mathematician Leonid Kantorovitch on a tram as he rides to a consulting he is obliged to perform. No, he didn’t mind. Besides, there was a duty involved. If he could solve the problems people brought to the institute, it would make the world a fraction better. The world was lifting itself up out of darkness and beginning to shine, and mathematics was how he could help. It was his contribution. It was what he could give, according to his abilities. He was lucky enough to live in the only country on the planet where human beings had seized the power to shape events according to reason, instead of letting things happen as they happened to happen, or allowing the old forces of superstition and greed to push people around. Here, and nowhere else, reason was in charge. As he heads to Plywood Trust, he comes up with a key mathematical insight in optimization theory. He didn’t know yet what sort of percentage he was talking about, but just suppose it was 3%. It might not sound like much… . But it was predictable. You could count on the extra 3% year after year. Ahove all it was free. It would come merely by organising a little differently the tasks people were already doing. It was 3% of extra order snatched out of the grasp of entropy. Suppose that the Soviet economy could be made to grow by an extra 3% a year—an extra 3% year after year, compounded. It would mount up fast. After only a decade, the country would be half as rich again as it would have been otherwise. … And he could hasten the hour, he thought, intoxicated. he gazed up the tram and saw everything and everybody in it touched by the transformation to come, rippling into new and more generous forms, the number 34 rattle box to Krestovsky Island becoming a sleek silent ellipse filled with golden light, … . It’s a beautiful passage, which—due to my many omissions—I’ve barely captured. On reaching the end of the free Kindle fragment, I downloaded the rest of the book and continued. Each chapter is a marvel, focusing on characters large and small. I’m about two-fifths of the way through now, having just read a chapter on the writer Sasha Galich in Moscow, 1961. He has begun to have doubts. Drip by drip, these last years, he had understood more of what had been happening in his own time, just around the corner, behind the scenes, just out of his sight, as if he had been a child in a fairytale wood who sees only green leaves and songbirds ahead, because all the monsters are standing behind him. Quiet conversations with a returned choreographer, almost toothless, who’d survived his ten-year stretch on dancer’s strength. Confidences from an uncle’s friend, a secret policeman blurred by a bottle … about the famous year of 1937, when the vanloads came in so fast for the bullet that the drain in the floor of the basement corridor sometimes blocked … A drip of knowledge from here and a drip from there, till he saw that his lucky world was founded on horror. Like Peter the Great’s city beside the Neva, his city was built upon a layer of crushed human beings, hundreds of thousands of them, or perhaps even millions. And you were not supposed to mind too much. It was enough to be assured that such things no longer happened, that mistakes had been made but were now corrected. It served no purpose to look back. It did no good to toss in bed in your elegant apartment and remember the ways in which you’d helped to give horror its showbiz smile, its interludes of song and dance. Oh, and there’s more. Spufford has a website (with the title Comrades, Let’s Optimise!) containing links to pages on Kantorovich, Galich, Soviet Jokes, Fairytales, Logic, The Good Life. So much to explore. Perhaps I’ll have more to say when I’m done.